groove and the power of the vocals. I then decided to round up some musicians anda sound engineer to see if we could complete and give it some more driving force. Well, a lot of water went down the creek in the meantime, who would have said that this weekend we’d celebrate our release nr. 20! But… here we are, and we wanted something special for this celebration, something that would bring us back to the roots, back to what have always been the foundation of our record label style: Acetate Side & Take Side. 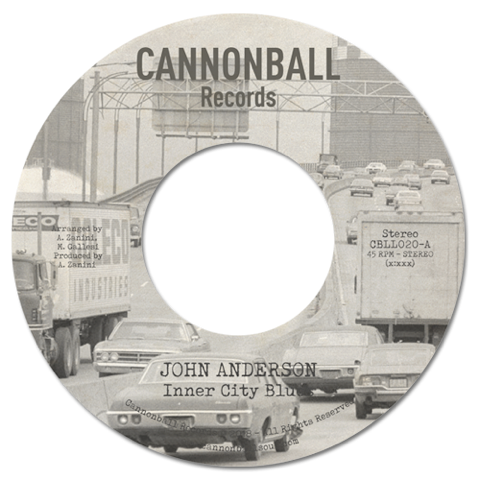 John Anderson’s “ Inner City Blues” represents all of that and more. It is an absolute preservation release as it bears the demo version on one side and the instrumented oneon the flip, which has been realised respecting the dry sound of the early 70’s original take, following the harmony of the universally known masterpiece penned by M. Gayeand covered by a moltitude of artists of all provenances, soul, funk, blues, rock, and anyother musical genres. This recording was made in Manhattan presumably not later than the end of 1970, since our investigation shows that the Angel Sound Studios shut down in the autumn of that very same year. Before you guys start making questions: YES, weknow that the magnificiency of Marvin’s version is unparalleled (though in total honesty Idig more Scott Heron’s one) and so it will stay for decades to come. And NO, be reassured we are not that megalomen to aspire to match Marvin’s greatness with our instrumented version. We simply found it and, being it a dramatically early version from along forgotten soul artist and from the same year of “Whats Goin’ On” release, we have simply done our job by bringin’ it to you and refusing the fact that it could stay in the darkness forever.